Tim Holden is getting a last-minute boost from Ed Rendell. The former Guv threw his weight behind the incumbent Congressman, saying his experience and seniority are crucial for Pennsylvania. It’s been a hard-fought primary in the 17th district, as Holden has worked to hold off challenger Matt Cartwright, an attorney from Lackawanna County, as well as about half a million dollars in PAC attacks. 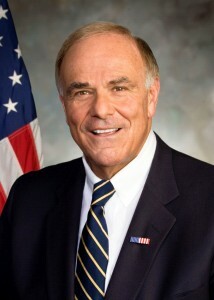 “I am enthusiastically endorsing my friend Tim Holden to continue representing the state of Pennsylvania in Congress,” said Rendell. “Throughout his distinguished career, he has admirably served the people of the Commonwealth as a member of Congress. Holden has a wide lead in the endorsement race, but Rendell’s wasn’t the only big Democratic name at play in the district this weekend. Former Rep. Joe Sestak headlined a rally for Cartwright today in Easton. @getting silly: in what universe are judges beholden to attorneys? you have no idea how the legal system works, do you? Thanks, Ed. Just what I needed to confirm what a scum Holden is, your endorsement. Sleazy hacks. Couldn’t the same argument be made regarding the judges who took money from Cartwright? Wouldn’t they be beholden to him as well? I spend alot of money on judges isn’t exactly the best explanation given recent developments? The point is there are a whole lot of voices in this race bending facts. This is a poster child race for money in politics making everything a caricature. Also, it doesn’t make the facts of the fracking claim bookends any more true. How often are people going to look up a vote instead of looking at the pictures and the commercials? The “unvetted I-Report” is lifted verbatim from a Times-Leader piece. Seems pretty legit. Holden is an incumbent with issues who seems ‘be-Holden’ to special interest groups of dubious merit and deep pockets. Cartwright’s a newbie, but I don’t see anything in Holden’s voting record that makes me believe he puts the best interests of his constituents before those of his faceless corporate campaign contributors. Ted, so an unvetted I-Report, on misleading ads, by an antifracking activist, in a campaign full of misleading fracking ads, is what I’m to go on? You can blame the committee that put the bill together, but it is misleading to blame Holden (or Obama) individually for the loophole because he only voted on “the Energy Bill” as a whole. My cousin Ed has chosen poorly. What will these politicos say when Cartwright wins?